German Chocolate Cake is just about the definition of decadence in my mind. Chocolate galore, pecans, almonds, coconut, etc., it's all there. It's just about as rich as you could imagine and frankly, it's delicious. 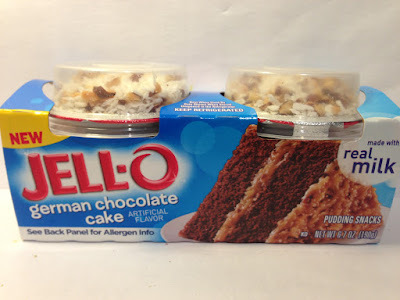 When I was in Meijer and saw that JELL-O was going to try to re-create that decadence in pudding form, I knew I was due for another JELL-O Mix-Ins review with this review of the JELL-O Mix-Ins German Chocolate Cake Pudding. I picked up this two pack at a bargain basement sale price of $1.25 and each pudding cup is roughly 3.4 ounces and 150 calories. As with the premise of this Mix-Ins line of products, the Mix-Ins are packaged separately so that you can do all the hard work. In this case, the mix-ins include shards of toasted coconut, almonds and pecans. When I opened up the separate container prior to mixing everything in, I was overcome with the smell of coconut and being that I've developed an almost borderline obsession with coconut recently, I very much enjoyed that. The pudding cup itself had a base of chocolate pudding topped with a wonderfully sweet smelling caramel pudding to emulate the cake's filling itself. Once I dumped in and stirred up the separate container of mix-ins, I got what you see above. It was a total mess of everything nearly overflowed the pudding cup itself (I'm finding that is a recurring them with these Mix-Ins; I love mix-ins, but how much is too much?). 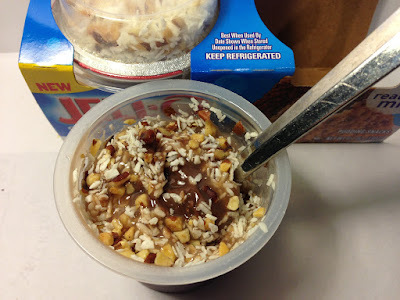 Prior to taking that first spoonful, I was met with the wonderful combination smell of chocolate, caramel and coconut. Basically, even though the spoon was steel, the smell made me so hungry that I would have chewed through it if I had to. The smell was a harbinger of things to come because this was downright delicious. The toasted coconut's sweet flavor shined through and outside of the chocolate pudding, was the most prevalent flavor in the cup. The pudding edged it out though just by sheer quantity of pudding, but the fact that I even have to point that out shows how much flavor the toasted coconut possessed. The pudding, while basic chocolate, was also quite delicious and seemed creamier than typical chocolate pudding. I'm used to eating the sugar free JELL-O puddings, so perhaps this is just the density and creaminess of typical chocolate pudding and I'm unaccustomed to it, but I enjoyed it. The caramel "frosting" added a nice sweet accent to the taste of the chocolate and brought just one more flavor component to this pudding cup. As for the almonds and pecans, well, I couldn't really taste their flavor, but the crunch that they brought to the mix was certainly welcome and wonderful. Buy It or Fly By It? I can't say enough good things about this pudding cup and after finishing the roughly 3.4 ounces, all I could only think about two things and those were that I wanted more of this pudding and/or I wanted an piece of actual German Chocolate Cake because this cup did such a wonderful job re-creating the cake in pudding form. It's that glowing review that leads this to an obvious BUY IT rating. If you want to add some of that decadence into your life in a hilarious way since it is a pudding cup, pick up this successful addition to the Mix-Ins product line and I believe you'll feel the same way.